Good workers are able to analyse, act and achieve results when things are ambivalent. They are able cut through the fog of mixed messages or uncertainty. Getting to the heart of the matter, they channel their energies towards doing good work. Sometimes they also mobilise people to align their efforts towards achieving a specific goal. Managing ambivalence is a key skill in life. Some people have been taught to expect things to be linear and predictable. They can reach a point in their careers, however, when they encounter uncertainty. They may have bosses who fail to provide direction or who change strategies from month to month. Good leaders, for example, are good at managing such situations. When there is a vacuum, they provide a vision. They encourage people to focus on what they can control and deliver positive results. 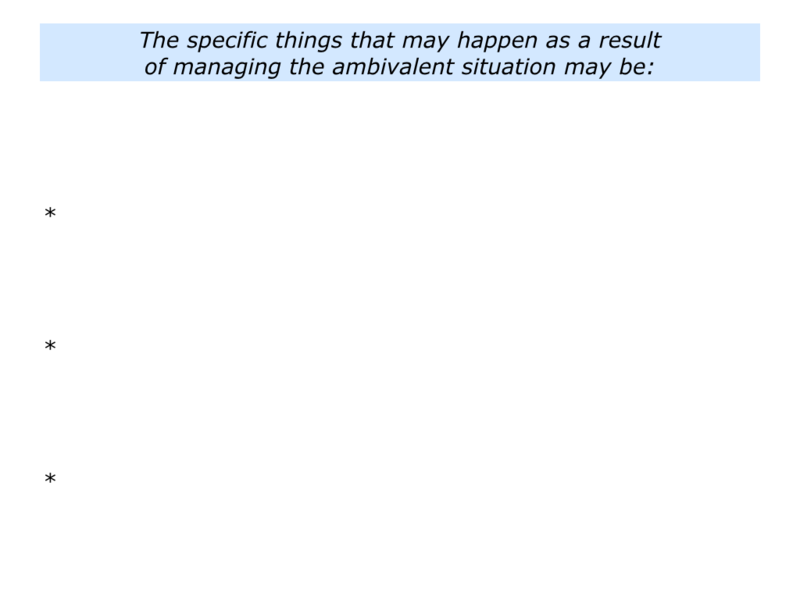 The classic definition of ambivalence describes it has having mixed or contradictory feelings towards something. Now the term is also stretched to include people being uncertain or indecisive about the potential ways forward. Looking back, when have you been able to deal with an ambivalent situation? You may have been uncertain about which path to pursue in your life or career. Alternatively, you may have been in a situation where people seemed unable or unwilling to make a decision. 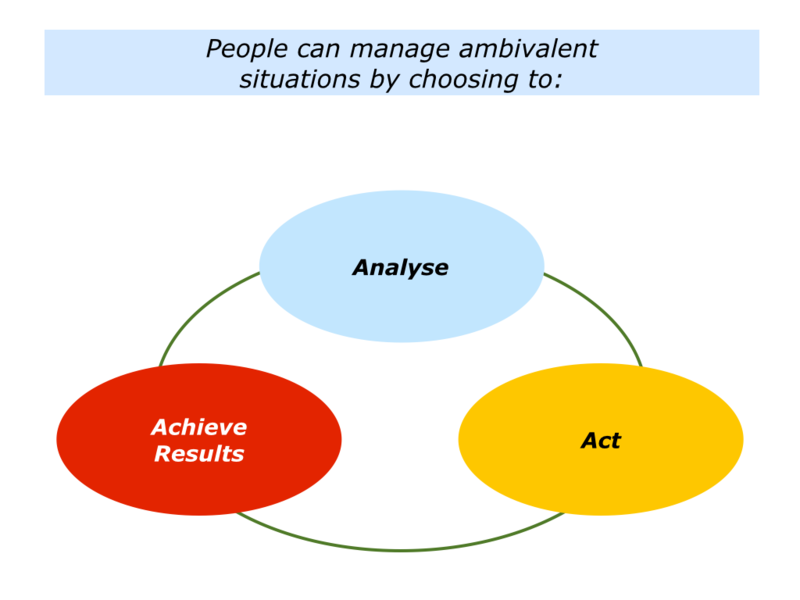 What did you do to manage the ambivalence? What did you do to analyse it, act decisively and achieve the desired results? If you wish, try tackling the exercise on this theme. Looking back on your life and work, this invites you to do the following things. 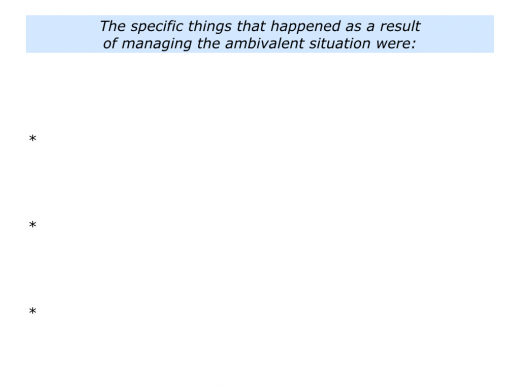 Describe a specific ambivalent situation in the past that you managed successfully. 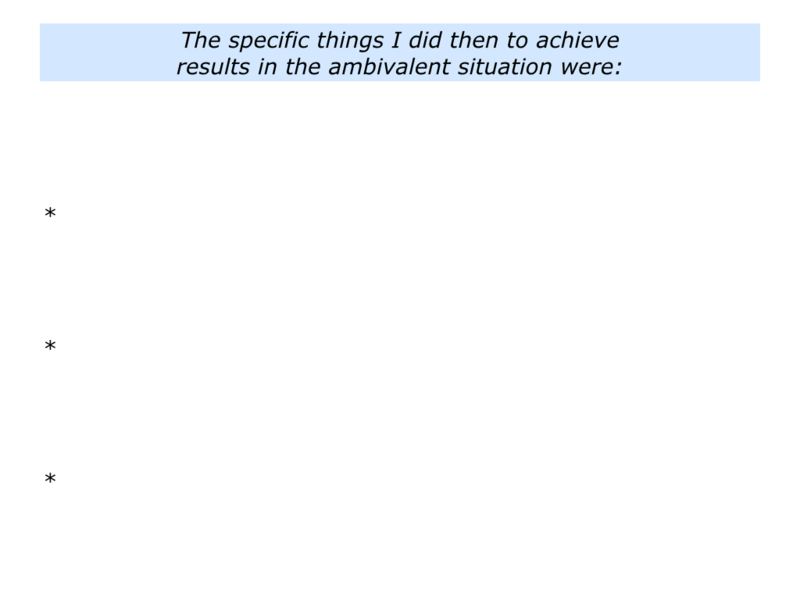 Describe the specific things you did then to achieve results in the ambivalent situation. Describe the specific things that happened as a result of you achieving results in the ambivalent situation. How can people learn to deal with ambivalence? Employers, for example, know it is vital to have people who can manage changing circumstances in a fast moving world. Bearing this in mind, there is an increasing emphasis on students learning what are called 21st Century Skills. These are the Four Cs: Critical Thinking, Creativity, Collaboration and Communication. Such skills are, of course, timeless. Many educators have nurtured these skills in pioneering projects over the past 200 years. It is only recently, however, that employers have stated they want people who can apply these their daily work. The video below is by EdLeader21 and the Pearson Foundation. It describes how this approach is being implemented in three parts of the United States. 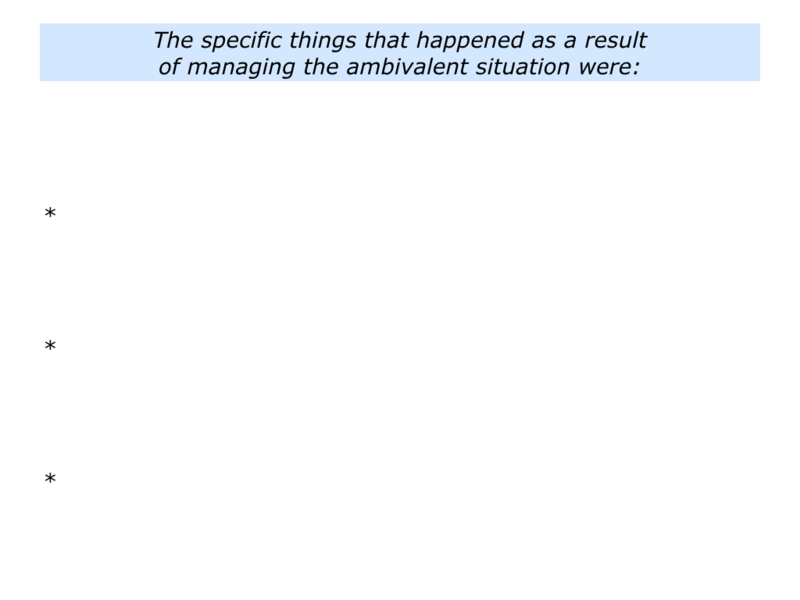 As mentioned earlier, there are many models for delivering results in ambivalent situations. One approach is to analyse, act and then achieve the desired results. This starts by analysing what is actually happening. It is important to focus on actual behaviour, however, and the consequences. Certainly it can be seductive to try to interpret behaviour, but this is not always fruitful. Good decision makers analyse what is happening in a situation. Clarifying what they can control, they explore the potential ways forward. They also identify the pluses and minuses of each option. Settling on their chosen way forward, they clarify the real results to achieve. They translate this into a clear picture of success. Good decision makers then move into action. They pursue the key strategies most likely to deliver success. They perform superb work and do what is necessary to achieve the desired results. Such people ask certain kinds of questions before setting out on the journey. They explore the following themes and questions. What is actually happening? What can I control in the situation? What are the potential options for going forward? What are the pluses and minuses of each option? Bearing these in mind, which is the route I want to pursue? What are the real results I want to achieve? What is the picture of success? What are the key strategies I can follow to give myself the greatest chance of success? How can I translate these into a clear action plan? What will be the milestones – and who will do what by when – on the road towards achieving the results? How can I perform superb work? How can I anticipate and manage challenges? How can I get some early successes? How can I encourage myself and other people on the journey? How can I do whatever is necessary to achieve the picture of success? Let’s return to your own life and work. Looking ahead, can you think of a potentially ambivalent situation when you may want to achieve certain results? How can you manage such a situation successfully? 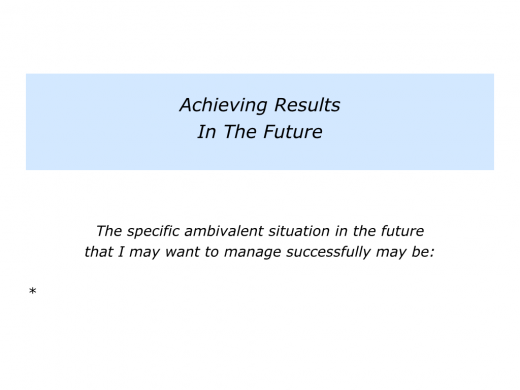 Describe a specific ambivalent situation in the future that you may want to manage successfully. 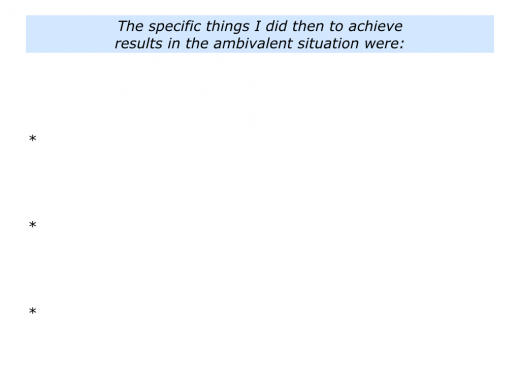 Describe the specific things you can do to achieve results in the ambivalent situation. 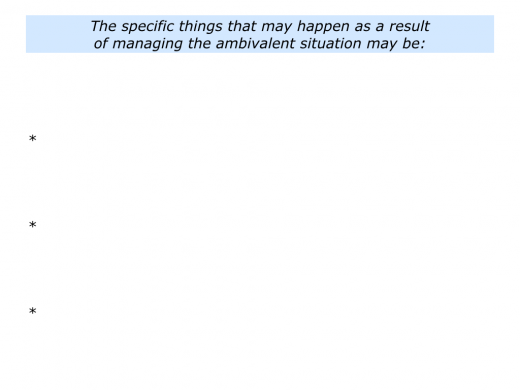 Describe the specific things that may happen a result of you managing the ambivalent situation.